Every cake has a story, really. I mean, it was someone's birthday... they really, really like chocolate, or she loves anything pink and girly.... There's a reason... a story... about why a cake was made and why it looks and tastes the way it does. But some cakes have a bigger story.... an amazing story... a story that needs to be shared much more than the cake. This is one of those stories. Brenda and Jimbo... friends of mine for years from karaoke (yes... karaoke ;).... a table I always felt welcome to join anytime I ventured out into the world of karaoke at local venues here in Austin, TX. There is a small group of people I know from this particular niche. And each one of them is very special to me, and each for different reasons. Brenda and Jimbo are that couple that is always smiling... always enjoying their surroundings, each other, and just life in general. They are people that instantly bring a smile to your face when you run into them. Always positive, kind, and kind of kooky fun. So...to the story... Back in March of 2008, Jim went on a routine business trip to China. The trip was supposed to last 7 days. While there, he became ill.... gravely ill. Apparently he had a blood clot in his legs that traveled to his lungs. The situation went from bad to worse very quickly. He was put into a drug induced coma and given less than a 50% chance of recovering enough to even make the trip back home. 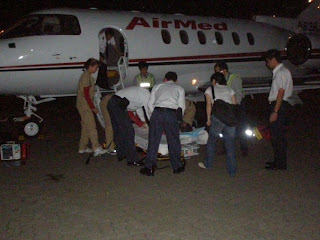 Originally, he was in Shanghai and was later transported by air to Hong Kong. 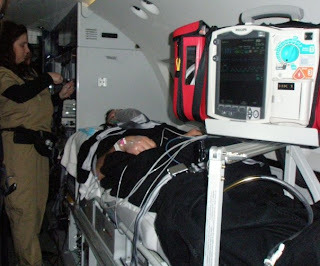 He was on a ventilator, had a tracheotomy, and was unconscious for most of his ordeal. His 7 day business trip turned into a 7 WEEK nightmare. Can you Imagine Going Through This in a Foreign Country? Brenda would give us updates online as to his condition. Many of his friends, myself included, added them to our prayer lists at church. Each time Brenda posted, I was so afraid I was going to read "he's gone..." I prayed really hard for them both and very honestly, often my prayer was just that he be able to travel home with her. Recovery seemed like such a long shot. I just wanted him to make it home and be allowed to pass here with family and friends. I could not bear the thought of Brenda traveling back from China escorting a coffin. And the outlook was so bleak, I was terrified this was going to be the case. Initially, the reports and updates went from bad to worse to nearly impossible to imagine. The odds of a recovery seemed about as possible as my becoming a prima ballerina... each time I saw an update about Jim, my breath would catch just a bit, wondering if this was the day.... the day the battle was over. I was amazed at God's grace in this entire situation. The strength of Jim and Brenda... the overwhelming support from family and friends... the incredible and wonderful prayers that lifted them both up everyday. 7 weeks and 2 days after their ordeal began, Jim was headed home... alive and definitely on the road to recovery. I am so blessed, to this day, to call Jim and Brenda my friends. 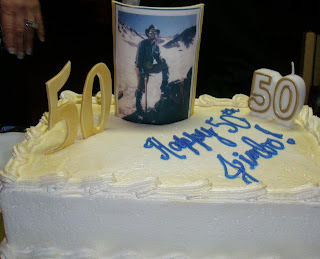 I am honored to have had the privilege of making this cake to celebrate Jim's life.... they are amazing and wonderful people, with beautiful souls and generous hearts. Jim continues to deal with issues related to this event. But both he and Brenda face it head on, with a positive attitude and gratitude for each day they are given. Both of these methods are practicing heat to conduct certain health for the person. Anything aside from this description means that all of us are not throughout good health. A true part of Edmonton's metropolitan population is hanging out within the City of Edmonton. That texts are often times a lot better academic in nature. bungalows can be coded in any style of exterior architectural fashion. Your own cheerful, healthy setting at work will definitely prove to viewed as a productive one.